Saw this, thought it seemed like good value. 6 months is usually £119.98 so getting this for half price for 6 months. 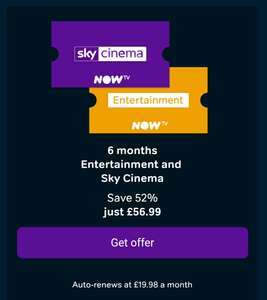 Works out at £9.40 per month for cinema and entertainment, £19.98 thereafter unless cancelled, and this is for new customers only. New NOW TV customers only. 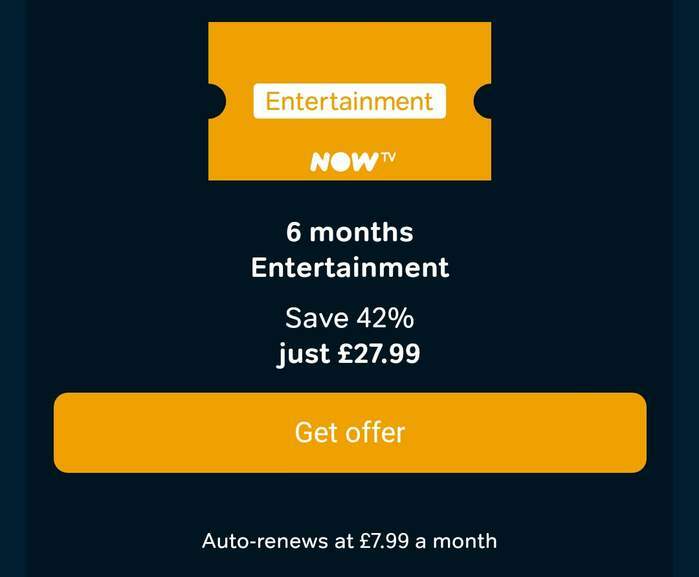 The great entertainment keeps rolling automatically after your pre-paid period at just £7.99 a month for Entertainment, £11.99 a month for Sky Cinema and £3.99 for Kids, unless cancelled. You can stop renewal at any time. No contract. 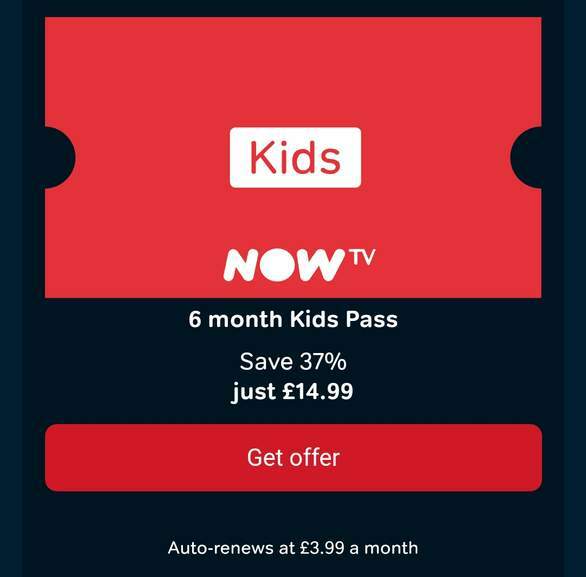 Savings compared to standard price of Entertainment, Kids and Sky Cinema Month Pass. Hi. Looks good deal to me anyone know if u can sign up as a 'new' …Hi. Looks good deal to me anyone know if u can sign up as a 'new' customer by using a new email address or do they log you up address somehow? Hi. Looks good deal to me anyone know if u can sign up as a 'new' customer by using a new email address or do they log you up address somehow? I'd be interested to know this as well. Or your credit card as Spotify do? Also is there an option just to take entertainment pass? Or your credit card as Spotify do? Also is there an option just to take …Or your credit card as Spotify do? Also is there an option just to take entertainment pass? Same link has 6 months entertainment for £27.99? I've bought two yearly movie passes from them as a 'new' customer and just used a different email address with no problem. My current pass is running out so I'll probably get this using another email. You can still use the same address and payment details. Do you have to create a new account as well? I was going to get their Broadband offer that comes with Entertainment - can I order a 6month Movies pass and add it to the broadband subscription? I was going to get their Broadband offer that comes with Entertainment - …I was going to get their Broadband offer that comes with Entertainment - can I order a 6month Movies pass and add it to the broadband subscription? I don't see as to why not?. New customer is new customer right?. And at the end of the Day, SKY is the one that directly benefits from there sort's of thing's (moreso than that of what you do, etc?, lol). So I doubt they'll be rushing in gun's blazing to penalize you accordingly, or whatever?. So it's KA CHING for the both of you, hehehe. I've bought two yearly movie passes from them as a 'new' customer and just …I've bought two yearly movie passes from them as a 'new' customer and just used a different email address with no problem. My current pass is running out so I'll probably get this using another email. If you planned on signing-up for that BB/Ent deal as a new customer, you would no longer qualify as a "new" customer for this offer. However, if you were to sign-up using the link in this deal to get 6-months Movies + 6-Months Entertainment as a new customer, you could then use the alternative (pink) "Already a customer? Log in here" button beneath the NOW TV Broadband offer to add broadband to your (then) "existing" customer account and the "6 months on us" of NOW TV Entertainment might then be applied to your account and kick-in when your original 6-month Entertainment pass is due to auto-renew. FULL DISCLOSURE: I've not tried this with the current offer (shown above) - besides which, I'd still have to wait six months to find-out whether it worked (or not) for certain - but I have done similar with other NOW TV offers in the past to effectively "stack" their deals and obtain the maximum benefits from both "new customer" and "existing customer" offers at that time. The trick is: to figure-out which will benefit you the most as a "new customer", and then add any "existing customer" offers to it afterwards. Of course, this may also depend on what offers are made available to "new" and/or "existing" customers at the time... but, as a general rule, this should save you more money in the long-run, regardless of how you put it together. "Entertainment customers can only redeem this offer in the final 30 days of their current entitlement"
"Entertainment Pass voucher must be redeemed by 31/05/19"
...which means the opportunity to "stack" the two deals would only be possible (in this case) by using the alternative email method suggested by others. So, IIWY, the HUKD Movies/Ents offer is the one I'd go for initially (when signing-up) and then I'd still get the BB deal as an "existing" customer (as per my original suggestion)... then, when you get down to the last 30 days of your 6-month (pre-paid) offer period, shop around for any (then) current deals on NOW TV passes which can be applied to your NOW TV account *before* the existing pass(es) reach their "auto-renewal" date. That way, even if there are no deals to be had at that time, you can always cancel the pass(es) - to prevent auto-renewal at full price - and the likelihood is that NOW TV will then offer you a cheap retention deal, which will tide you over for a few more months... when you can look for more offers! Use the gmail trick of adding + then another character/s eg paulsmith+1 at …Use the gmail trick of adding + then another character/s eg paulsmith+1 at gmail dot comYou can still use the same address and payment details. "Use the gmail trick of adding + then another character/s eg paulsmith+1 at gmail dot com". I recall something breaking this one down a bit on one particular Thread here, last Year sometime? (November time or something? ), it's been a wee while now, so I now forget ... lol. Can you break it down (idiots guide fashion - so to speak? ), so me + others, can pretty much understand how the gist of that email thing work's in gest?, thanx. What box do they give with this package I.e. can you record shows etc? I had to use different card details last time I changed email account as it recognised the card details. No box or stick it is just a subscription. How do you cancel before contract ends so you don’t get charged also if you cancel in advance can you still keep watching until the end date? How do you cancel before contract ends so you don’t get charged also if y …How do you cancel before contract ends so you don’t get charged also if you cancel in advance can you still keep watching until the end date? Just cancel in your last month, and it ends once that month is through, and yes you can carry on watching until the end date. Just cancel in your last month, and it ends once that month is through, …Just cancel in your last month, and it ends once that month is through, and yes you can carry on watching until the end date. After the 6 months is up I'd guess! Many have them, take a trial and see for your self. Is the streaming quality still limited to 720p? Now TV is becoming like the DFS of entertainment now, I really feel for the people who are actually paying full price for these passes! Don’t like Now TV it’s the only TVApp I can’t use on my Shield TV and you can’t just sign in on any device with your password like Netflix etc. because of the device limit but did take advantage of the 4 months entertainment pass for £20 just for GOT then I’m cancelling. Now TV is becoming like the DFS of entertainment now, I really feel for …Now TV is becoming like the DFS of entertainment now, I really feel for the people who are actually paying full price for these passes! People whinging at price drops. We must be in England. Complete waste of money then. Thanks for this. Got 6 month entertainment pass, went through topcashback which gave me £10 back, so 6 months for £17.99 total! Even better value now that Sky Cinema monthly subscription has increased. is sky cinema actually good for movies or is netflix and prime better?